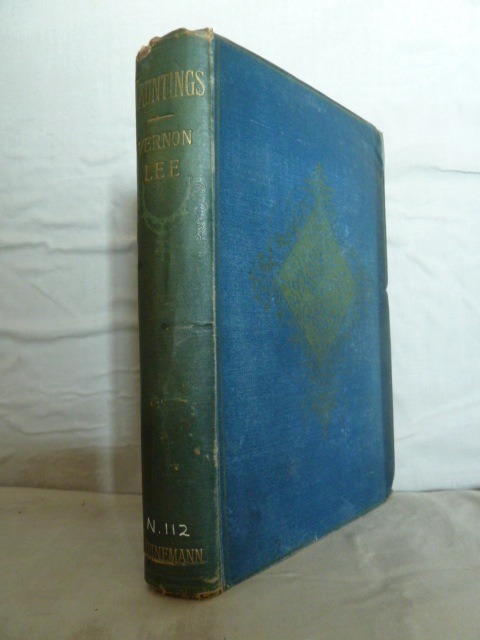 Any collection of classic ghost stories of the Victorian and Edwardian periods is sure to contain at least one story by Vernon Lee (1856-1935). 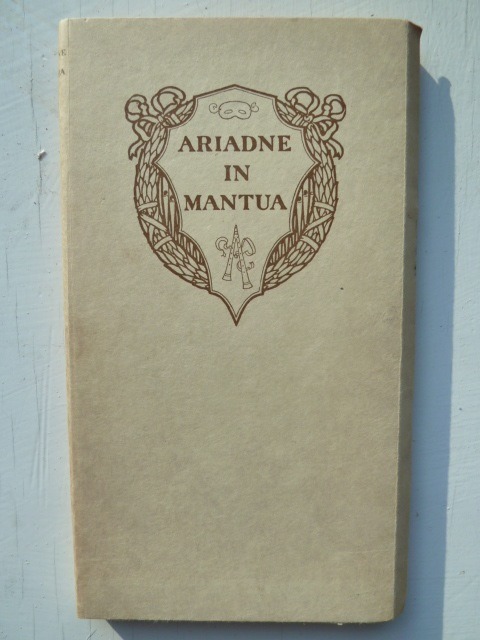 In his marvellous introduction to "The Supernatural Omnibus" (1931) Montague Summers compares her to M R James in her mastery of atmospheric detail and goes so far as to say that neither James nor Sheridan Le Fanu can be ranked above the genius displayed in her greatest collection of supernatural fiction "Hauntings" (Heinemann 1890). There are four stories in "Hauntings", revealing the power of the past to influence with disastrous consequences those who fall under the particular spell lingering at the site of previous events. Three are set in Italy, where Vernon Lee spent many years of her life. In 'A Wicked Voice' a composer residing in Venice is haunted by the voice of a long dead singer and longs for death while listening to the magical sound. The hero of 'Amour Dure', a Renaissance scholar, is pursued to his death by the ghost of a famous 16th century beauty, who was murdered by one of the many lovers whose hearts she broke, and now seeks revenge on the living. 'Oke of Okehurst' (my favourite) is set at a country house in Kent. Mrs Oke's portrait is being painted and she chooses to dress in the style of a previous Mrs Oke, who, centuries earlier had conspired with her husband to murder her lover Lovelock. Mr Oke becomes more and more jealous as his wife becomes obsessed with this story and imagines she is having an affair with the ghost of Lovelock. He finally kills both himself and his wife. These stories are much richer than can be conveyed by a brief summary and all offer multiple interpretations given the suspect psychological states of those being haunted. 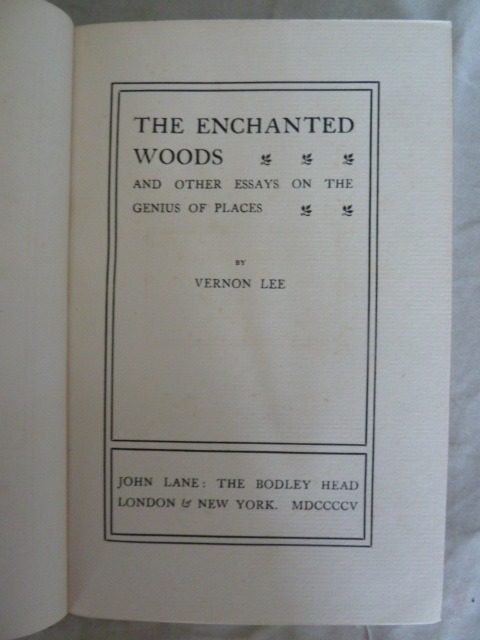 That Vernon Lee herself was acutely sensitive to the effects of certain places on the mind is evident not only from these stories but also from her many travel essays and occasional writings. 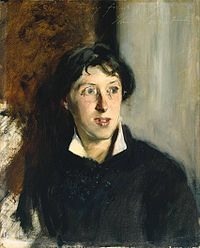 Violet Paget, who wrote under the name Vernon Lee, was born in a chateau near Boulogne to English parents who spent much time on the continent. 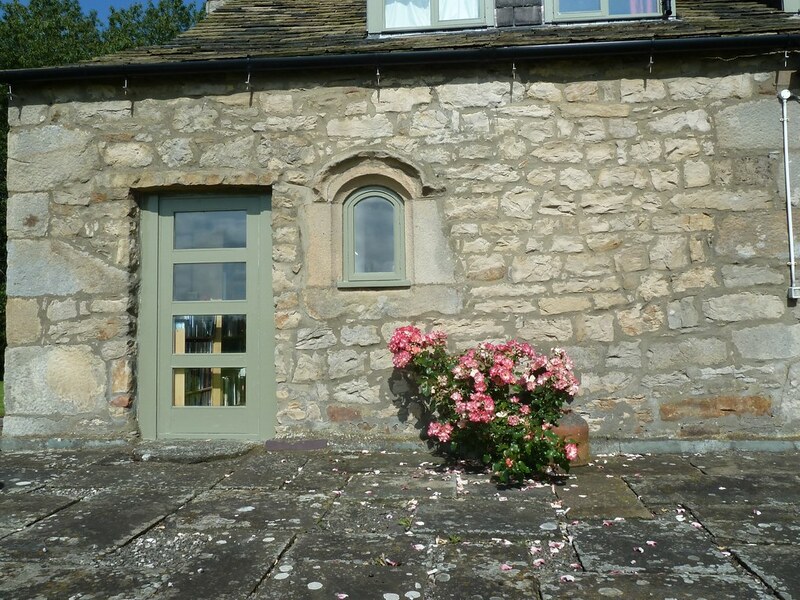 In later life she chose Italy as her country of choice but did spend time in England, for example at the village of Fladbury in Worcestershire. 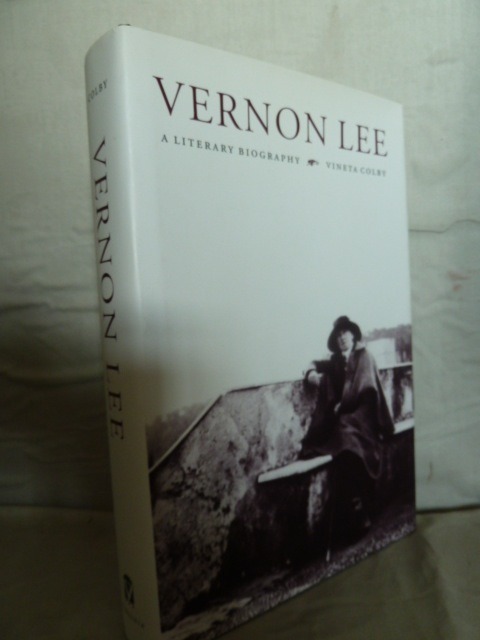 The best recent study of her life and work is Vineta Colby's "Vernon Lee: a Literary Biography", published by the University of Virginia Press in 2003. She was a formidable scholar, steeped in Italian and Renaissance history, and this adds considerable depth to her stories set in Italy. 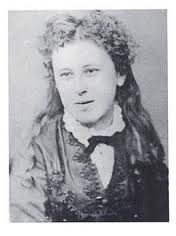 She had a wide circle of literary and academic friends including Robert Browning, Henry James, Walter Pater and Bertrand Russell. Her first book, published in 1880, was "Studies of the Eighteenth Century in Italy"; her final book was "Music and its Lovers", published in 1932. In between came many books covering her range of interests, particularly essays on travel and places special to her. 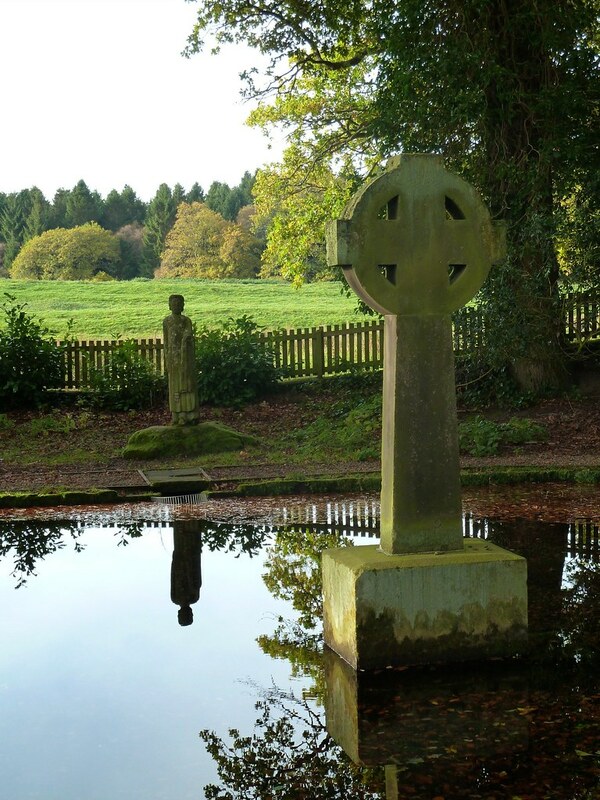 We visited such a sacred place, the Lady's Well at Holystone in Northumberland, on a recent holiday and if the spirits of the water do not reside here then they are no more. Her philosophy of life is contained in a much reprinted work "Hortus Vitae, Essays on the Gardening of Life", which discusses subjects such as reading books, hearing music, the virtues of silence and returning to favourite places, anticipating by a hundred years some of the recent writings of Alain de Botton. But to return to the works for which she is most well known - her supernatural short stories. "Hauntings" was so good that it was unlikely her other collections would reach the same standard. However there is much that is good in these. 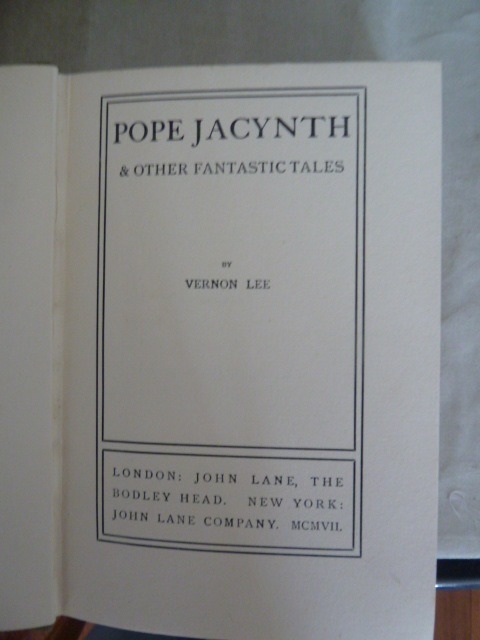 "Pope Jacynth and other Fantastic Tales" (John Lane 1907) contains four supernatural tales, perhaps the best is 'Prince Alberic and the Snake Lady', set in Italy and in which a spell is cast on an ancestor of Prince Alberic by the Snake Lady, demanding faithfulness for ten years. This condition is not met when the present prince meets the Snake Lady, resulting in his death. 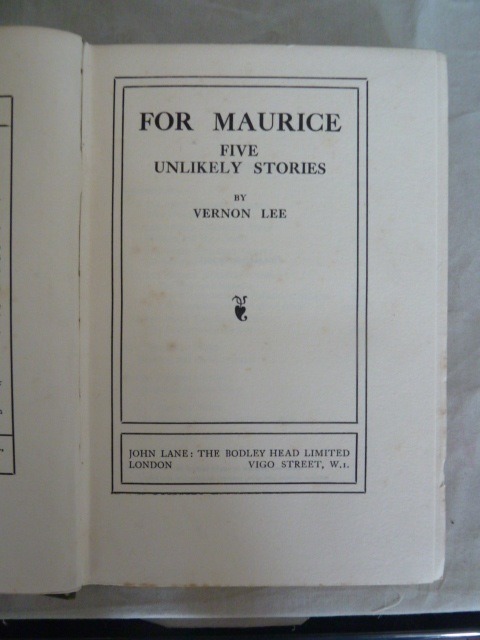 "For Maurice, Five Unlikely Tales" (John Lane 1927) contains the first Vernon Lee story I read - "The Virgin of the Seven Daggers", contained in the anthology "Fifty Years of Ghost Stories". "Other places become solemn, sad, or merely beautiful at sunset. 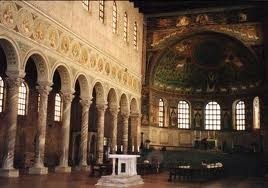 But Ravenna, it seems to me, grows actually ghostly; the Past takes it back at that moment, and the ghosts return to the surface. For it is, after all, a nest of ghosts. They hang about all those silent damp churches; invisible, or at most tantalising one with a sudden gleam which may, after all, be only that of the mosaics, an uncertain outline which, when you near it, is after all, only a pale grey column. But one feels their breathing all round. They are legion, but I do not know who they are." Being lucky enough to live in an old house, possibly of medieval origin, I too have felt this, but with a quite different response to that of Vernon Lee's friend. 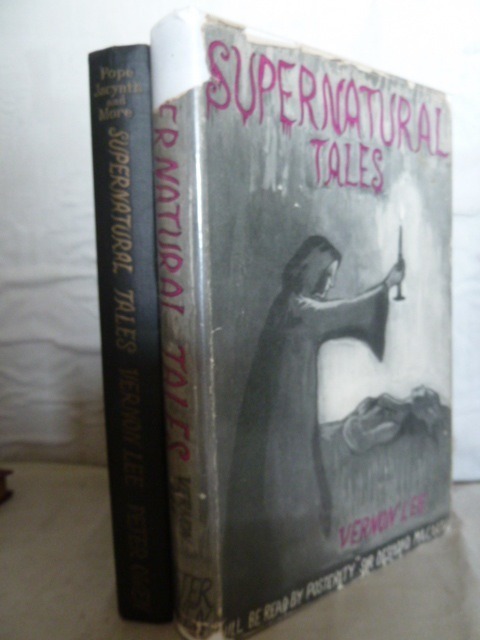 Browsing the shelves I find three small volumes, each revealing a different facet of the multi-talented Vernon Lee. "The Handling of Words and other Studies in Literary Psychology" is a detailed academic treatise on writing style, with analysis of writers as diverse as Carlyle, Kipling, Hardy and Henry James. In this work, Vernon Lee stresses the need for the writer to stimulate the reader's own imagination and shows how good writing achieves this. 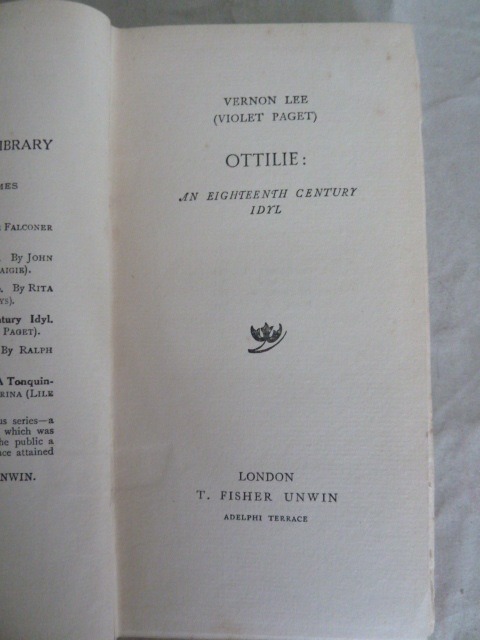 An attractive copy of "Ottilie, an Eighteenth Century Idyll" is next. This is a short story, set in Germany, in which Christoph tells of his childhood and early life with his sister Ottilie, who, following the death of their mother when he was born, is responsible for her brother's education and upbringing. Their life together is interrupted for many years when Christoph marries the unsuitable Wilhelmine. Eventually, the marriage ends in acrinomy and Christoph returns to Ottilie. The two then grow old together. A simple story, but so beautifully told that it seems to convey much more than is described in the actual events. 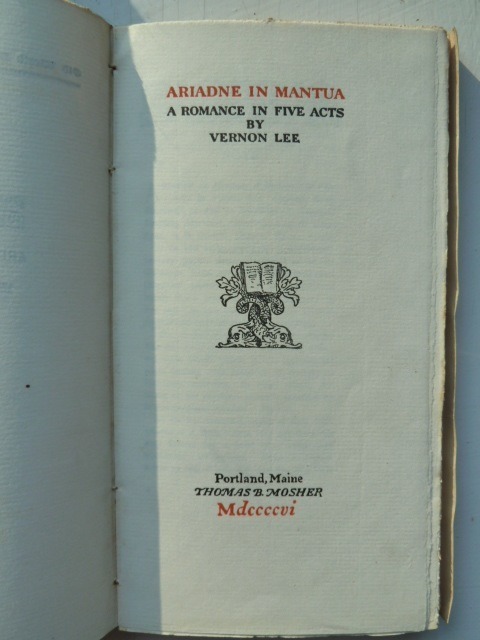 Vernon Lee wrote one play, "Ariadne in Mantua". We have an American Edition of this published by the 'Prince of Pirates', Thomas Bird Mosher of Portland Maine. Mosher was inspired by the private press movement in Britain and his books (albeit, at times, pirated) are very beautiful. This copy is no exception with its soft covers with yapped edges and elegant typeface. I suspect Vernon Lee would have approved. 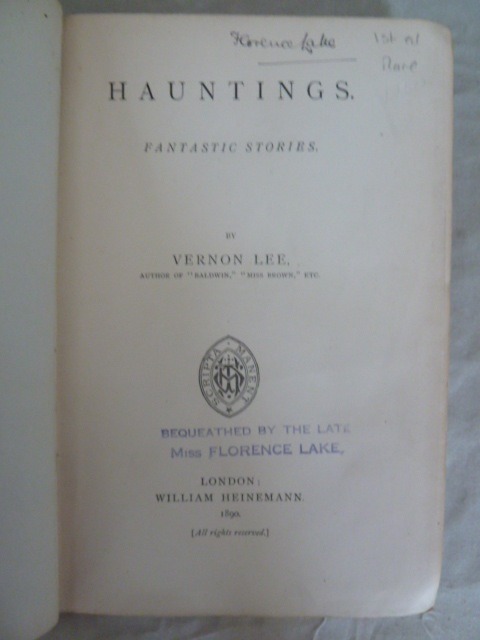 In recent years it has been relatively easy to find editions of Vernon Lee's ghost stories. 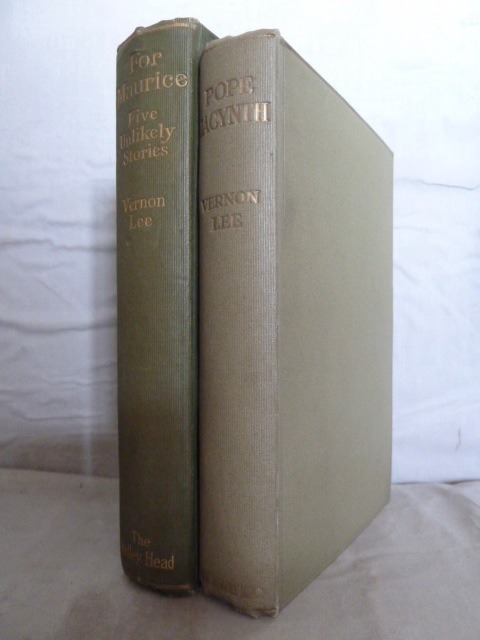 In the fifties Peter Owen published two volumes, "Supernatural Tales" and "Pope Jacynth and More Fantastic Tales". The former has an excellent introduction by Irene Cooper Willis. 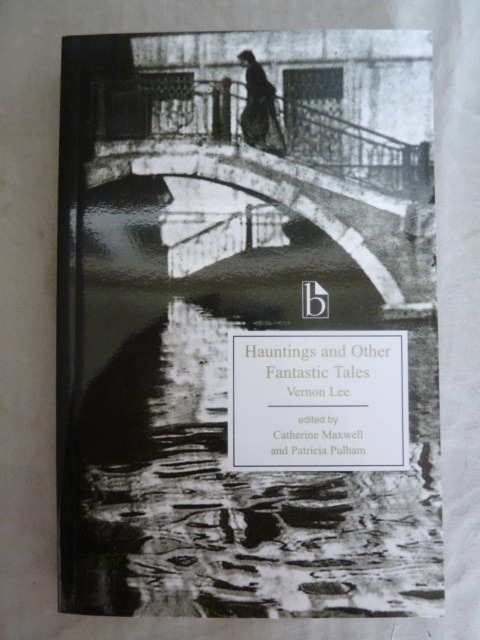 Broadview Editions have produced "Hauntings and Other Fantastic Tales", containing the four stories from "Hauntings" and three others. 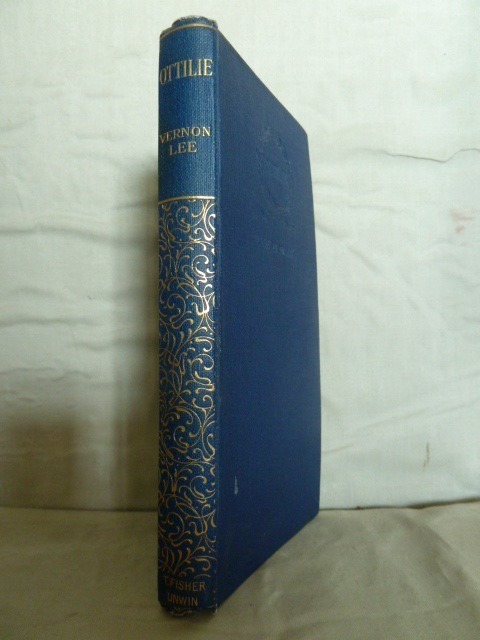 This has a long introduction, chronology of Vernon Lee's life, copious notes and several appendices by her contemporaries. 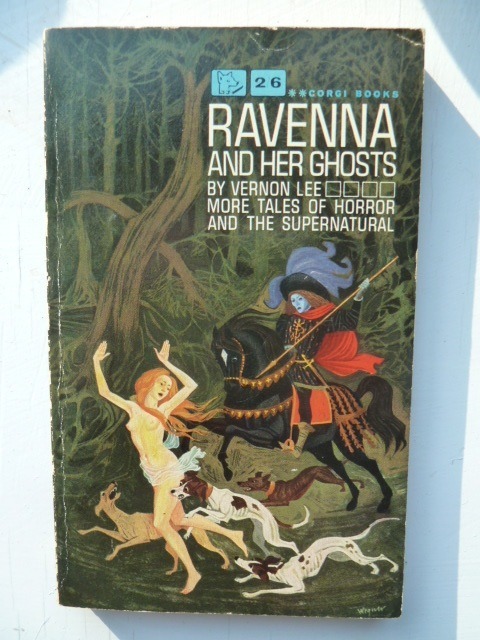 But the best place to find all of her supernatural stories and her two essays on the ghosts of Ravenna and the supernatural in art is the Ash-Tree Press edition of 2002, edited by David W Rowlands, who supplies a good introduction. 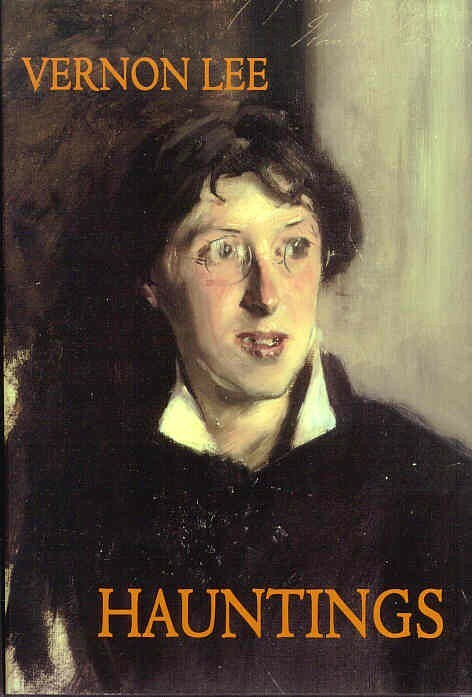 The portrait used for the cover was painted by John Singer Sargent. 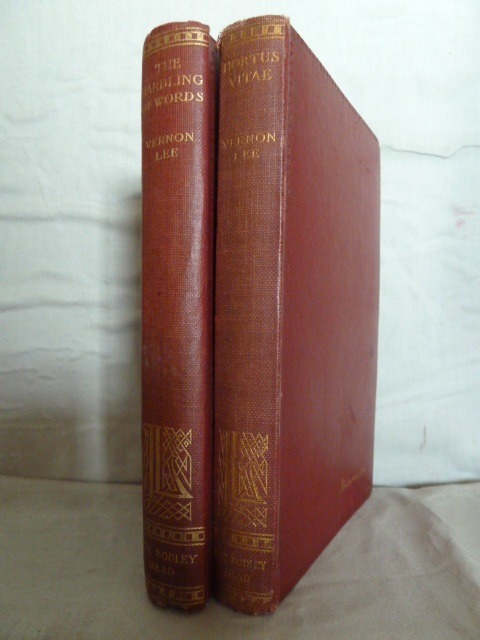 Vernon Lee was a consummate artist; one of the most graceful writers of the late nineteenth and early twentieth centuries and, even if it is nowadays only her classic ghost stories that are read, she has left a body of work on music, landscape and aesthetic appreciation that is unlikely to be bettered.